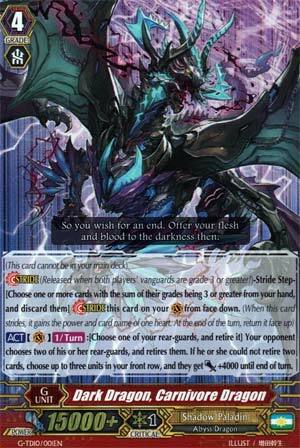 This card cannot be in your main deck) [Stride] (Released when both players' vanguards are grade 3 or greater! )-Stride Step-[Choose one or more cards with the sum of their grades being 3 or greater from your hand, and discard them] Stride this card on your (VC) from face down. (When this card strides, it gains the power and card name of one heart. At the end of the turn, return it face up) [ACT](VC)[1/Turn]:[Choose one of your rear-guards, and retire it] Your opponent chooses two of his or her rear-guards, and retires them. If he or she could not retire two cards, choose up to three units in your front row, and they get [Power]+4000 until end of turn. The main G Unit, and to be honest it's actually very good for a basic card. By murdering a rear-guard, the opponent must retire 2 of theirs. If they can't kill exactly 2 things, 3 of your rear-guards gain 4k. Oh sweet, so it's a +1 direct advantage to you no matter what for no Counterblast. Or alternatively against Hollow or Magia, you can have a whole column gain 8k and if you have a 17k+ column somewhere, that can force another 5k guard out of the opponent too...for a -1, but you have plenty of ways to recycle, or should do, anyway. Obviously too good to require a G Zone flip and enable GB2, but good for messing with boards and cleaning a field on your first Stride. As for if he IS a first Stride or not...it depends if you have a Heal Trigger. Otherwise, Aurageyser it is. At first glance, I thought Carnivore Dragon gave the opponent the option of either sacking two units or giving your front row 4k. Then, I actually reread the damn thing and realized that, in a rare occasion for Vanguard card design, they are required to retire exactly two units, and the 4k buff to the front row only happens if they didn't have exactly two things to sack. Since Carnivore Dragon is very much a first-stride kind of Grade 4, the opponent may have two to three vulnerable rearguards on board depending on if they decided to try and get some early damage on you. That means they might end up losing something important to Carnivore Dragon. Decks like Neo Nectar and Murakumo have to be careful on what they commit to board before you go into your first stride, because then those players have to make a painful choice. So basically, either you go into Aurageyser Dragon for the plus to your hand utilizing David, or Carnivore Dragon to minus the opponent. Carnivore Dragon's 4k buff isn't a super-hard punch, so definitely opt for Aurageyser Dragon if the opponent doesn't have at least two rearguards on board for your first Stride. I would comment on how Carnivore Dragon is good in case your budget doesn't have room for Aurageyser, but the thing's getting reprinted. Get 1 Carnivore Dragon and 2-3 Aurageyser Dragon.